A portable line/mic mixer 8x2 in flight case IN EXCELLENT CONDITION. THE LOCATION MIXER (UK made). - Low cut, Phase reverse, Phantom power. - Main, AUX, monitor and Headphone outputs. In case of malfunction or any other problem we try hard to solve the issue. 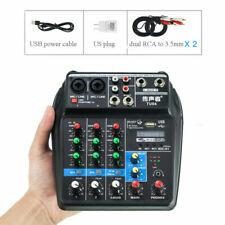 (48V Phantom Power 2 Mono 1 Stereo USB Play USB Record Computer Playback Computer Record Bluetooth Mini Audio Mixer. A) Connect Computer to Audio mixer. USB Play: MP3, WMA, WAV, FLAC. Record: by USB or PC. Microphone gain: -12DB -35DB. USB sound card Maximum support: 48K 16BT. 2 Live Cable. 1 Sound Card. Total sound length: 90 seconds. 1 Data Cable. Working current: 45MA. (USB Audio Mixer Console with Bluetooth Record 48V Phantom Power 4 Channels. A) Connect Computer to Audio mixer. 4) Bluetooth. NOTE : USB cable just for power. 4) Computer Playback. Record: by USB or PC. The product has an XLR input, a 1/8 input and 3 stereo RCA inputs. It has enough gain and output level to connect to the power amplifier, with RCA or 1/8 jack. Channel 1 has a microphone XLR input that can switch phantom power. 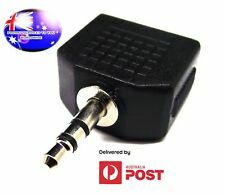 From OZ Quality 1PC 2 x 3.5mm Female To 1 x 3.5mm Male Stereo Plug Adapter +FP! 2x 3.5mm Female Socket To 1 x 3.5mm Stereo Male Plug Adapter. 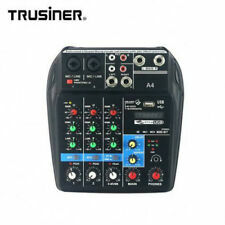 Mixer Console with Bluetooth Record 48V Phantom Power 4 Channels Audio Mixer USB. Power: 48V. Effect: Delay Repeat USB Play : MP3, WMA, WAV, FLAC Model: Computer audio mixer. Bluetooth function: YES. Mixing Console. XLR, phantom 48V. XLR balanced, pin 2 hot, 2K ohm, Sensitivity -40 to 14 dBu. L/R Output: XLR balanced, pin 2 hot, <75 ohm, 4 dBu, Max 22 dBu. THD N: <0.01%(Channel to mix out). - Individual phantom power. These power supplies also work in all countries which use 220-240v. 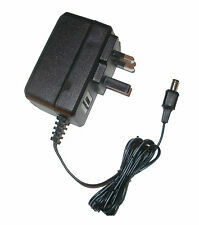 You will simply need a plug tip converter from UK to your countries plug type (which we don't provide). AC Power Type. Regulated Power.